Princess Nathalie of Sayn-Wittgenstein-Berleburg's pregnancy was announced last week. There was, however, some confusion whether a civil wedding had already taken place or not. According to the printed version of Billed-Bladet 30 March 2010, the civil wedding for Princess Nathalie of Sayn-Wittgenstein-Berleburg and Alexander Johannsmann will take place in May 2010. The baby is due in July. 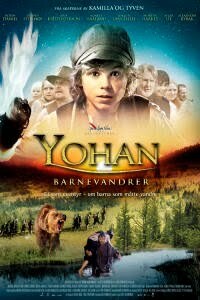 The first night of the Norwegian family film «Yohan – The Child Wanderer» took place on Friday 26 March 2010. The film is based on true stories about child wandering in Norway, which mainly took place in the 19th century, but didn’t stop completely before around 1910. In the early spring every year children were forced to leave their small family farms in Kvinesdal, Hægebostad, Marnardal and Audnedal to work at richer farms eastwards, first of all in the county of Aust-Agder. For the many poor families it meant less children to feed during the summer season and some money on their return. The children usually met at the local church before starting the long walk, cutting across the many Agder valleys in order to reach their final destination, often covering distances as much as 150-200 kilometres. On the richer farms, the children took care of the animals as shepherds or did ordinary farm work, like stacking hay, cleaning stalls etc. The main character Yohan is a young boy from the small farm Aamot in Audnedal who is forced to wander to the farm Nome outside Arendal in Aust-Agder county to work as a shepherd. Although built on true stories, the film makes a too romantic picture of the child wanderings, and the manuscript author and director has put too many ingredients into the film, including an impressive number of celebrities as well as of wild animals, like a lynx, a wolverine, numerous wolves and bears as well as foxes. There is no end to how many encounters Yohan has with wolves and especially the bloodthirsty bear which makes the climax of the film. It certainly has entertainment value, but the story should have been tightened up and made more balanced. I had also expected more «driving force» in the movie. The many young actors, most of them making their first appearances, do reasonably well, but as has been the case in too many Norwegian children movies, have not been taught how to speak clearly. Sometimes it was impossible to hear their lines. No, it has nothing to do with me – my wife is from Mandal and a part of my own family comes from Bjelland (Marnardal) and the surrounding valleys, so I know the South Norwegian dialects well. Maybe subtitles would have been in order? I have already mentioned the impressive number of celebrities. Did the filmmakers really have to overdo it? The list is almost endless: The Eurovision 2009 winner Alexander Rybak, Aha pop star Morten Harket, the pop star Morten Abel, the model and former pornographic actress Aylar Lie, former Idol star Alejandro Fuentes and yet another artist, Veronica Akselsen. And if that was not enough, former Miss Norway Kathrine Sørland and another former Miss Norway, Lene Egeli, have statist roles. I am not convinced that this is to the film’s advantage. But it must be said that Aylar Lie plays her role as a Roma woman rather well. Veronica Akselsen, who is of Roma ancestry, plays a Roma woman in the movie. Alexander Rybak, however, knows how to play the fiddle, but his acting skills were not that impressive. The movie has some family connections as well. There is a character in the movie named «Jordmor-Siri» («Siri the midwife») who is played by Veronica Flåt Tjelle. I don’t think the name Siri the midwife is a coincidence. My great-grandfather Søren Larsen Trygsland’s sister Siri, b. 1868, who was married to Søren Røynesdal from Seland, worked as a midwife and became quite an institution in the parishes of Bjelland and Grindheim. The latter is now part of Audnedal municipality, where the fictional Aamot family lived. Another connection is Jan Thomas Wåge Flatebø, who plays a minor role as the character «Rolf». He is a second cousin once removed to my wife Synnøve. His mother Anne Lise Wåge Flatebø has a role too as the farmer’s wife «Marie». Yohan is said to be the most expensive children’s film ever made in Norway. An English version of the film has also been made and will be launched in the summer of 2010. The funeral took place at Vestre gravlund (cemetery), Nye Kapell (New Chapel), on Friday 26 March 2010. According to information I have received privately, Erling S. Lorentzen and his wife Princess Ragnhild Mrs. Lorentzen were not present. It could be that the flight from Brazil is too long and tiring for the elderly couple. Erik Finn Lorentzen was born at Søndre Huseby in Aker municipality (today a part of Oslo) on 21 March 1921 as the fifth child of shipowner Øivind Lorentzen and Ragna Nielsen. Lorentzen's villa was situated in a street which at the time was still unnamed, but the address is today known as Husebyveien 6 and is owned by Erling Lorentzen. Erik F. Lorentzen served as a pilot during WW2 in Canada, United Kingdom and Africa. He studied to become a textile engineer and was in charge of Kunstsilkefabrikken ("The Rayon Factory") at Notodden until 1962. He was also the managing director of the family shipping company Øivind Lorentzen Rederi and of Øivind Lorentzen Sobral AS. In addition he was among others Vice President (1987-91) and President (1991-93) of Redningsselskapet (The Norwegian Society for Sea Rescue). Death announcement in Aftenposten 22 March 2010 No. 113, Kultur (Culture) section, p. 13 and Aftenposten 24 March 2010 No. 116, Kultur (Culture) section, p. 14. Obituary in Aftenposten 24 March 2010 No. 116, Kultur (Culture) section, p. 13. Information from Oslo Byarkiv (Oslo Municipal Archives). Updated Monday 29 March 2010 at 11.00, last time on Tuesday 31 January 2017 at 00.10. The engagement between Princess Nathalie of Sayn-Wittgenstein-Berleburg, youngest daughter of Prince Richard of Sayn-Wittgenstein-Berleburg and Princess Benedikte of Denmark, and the German businessman Alexander Johannsman, was announced in January this year. Today the Danish weekly magazine Billed-Bladet could reveal that Princess Nathalie is pregnant, and that the baby is due in July. More details are expected in the printed version, which will be published on 25 March. According to the article, Princess Benedikte and her husband are, not surprisingly, very happy on the young couple's behalf, and they are thrilled by the thought of a baby at the palace in Berleburg. The Danish Royal Court, which made a formal announcement of the engagement on 4 January 2010 - Princess Nathalie is a niece of the Danish Queen Margrethe II - has as far as I know still not commented on the story. The news surely comes as a big surprise, if not a shock, to most royal experts and diehard monarchists, as marriage first, baby second, is still "the golden rule" in royal circles, although one can of course find a few exceptions. Now it also appears, cf. an article published by Euro Dressage News today, that Princess Nathalie and Alexander were married in a civil ceremony shortly after the engagement was announced, which of course means that "the golden rule" has been followed after all. The church wedding is to take place in 2011. Hopefully a formal statement, with more details on the civil wedding, will be issued soon. Correction: According to the printed version of Billed-Bladet published on 25 March 2010, the civil wedding will take place before the baby is due in July, which obviously means that the information in Euro Dressage News that the civil wedding has already taken place is wrong. Updated on Thursday 25 March 2010 at 15.10. The latest issue of Royalty Digest Quarterly (no. 1, 2010) arrived in my mail box today. I look forward to reading it! I never have enough spare time for reading these days, but the daily trip by subway to downtown Oslo and back home again usually provide a few minutes of "literature time". I will make sure to bring the magazine with me tomorrow morning. So, what can I look forward to? The contents section reveals among others the article 'Connubial Equality'. Russia & Montenegro by Edward W. Hanson. The title reminds me that I soon have to blog about the visit I made to Cetinje last summer. Coryne Hall is a regular in the columns of RDQ. This time she focuses on "Erzsi", i.e. Archduchess Elisabeth of Austria (daughter of Crown Prince Rudolf and his wife Stephanie, née Princess of Belgium), in the article The Red Archduchess. The magazine's historical consultant, Charlotte Zeepvat, presents and comments on a few photographs in the article The Royal House of Prussia. A Family Album Part II: German Emperors and has also written Royal Artists. Reflections on a bundle of Postcards. The well-known blogger Diana Mandache contributes with Impressions of a Royal Family. Ileana of Romania's trip to Stockholm. The trip took place in the fall of 1928, if anyone wonders. 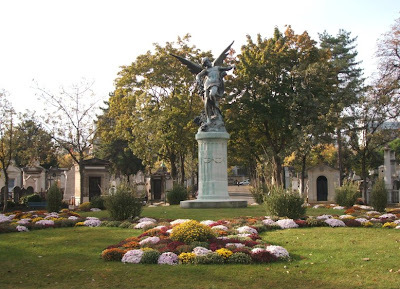 Michael Nash writes about The Jewels of the Habsburgs, while the historian and blogger Trond Norén Isaksen pays attention to the Bernadottes' connection to Pontecorvo in his article The Principality of Pontecorvo. Bernadotte's Stepping Stone to the Throne. Isaksen visited the Italian town in January 2008. The traces of Bernadotte in today's Pontecorvo are few, Isaksen tells among others. Diana de Courcy-Ireland has delivered the article On the Royal Trail. Isle of Wight, July 1st - 3rd 2009. As usual you will also find a few book reviews in the magazine as well as a small section with genealogical news. Royalty Digest Quarterly is published by Roosvall Royal Books, which can be contacted by e-mail royalbooks@telia.com. The RDQ is a successor to Royalty Digest - A Journal of Record, which was published in the period 1991-2005 by Piccadilly Rare Books. The front page of issue no. 1, 2010, presents a photo of Emperor Wilhelm II with his grandsons , Princes Wilhelm and Louis Ferdinand. Updated on Wednesday 24 February 2010 at 08.00. Watch out! The Swedish bears are waking up! 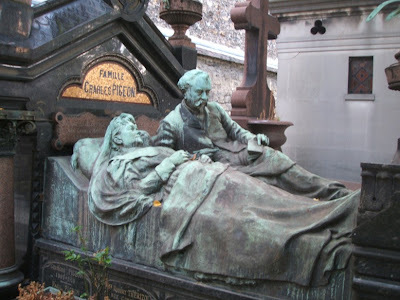 Grave of the engineer, inventor and manufacturer Charles-Joseph Pigeon (1838-1915) and his wife. See more information about the grave at Findagrave.com and Insecula.com. 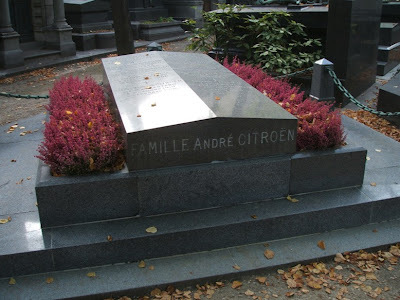 Grave of André-Gustave Citroën (1878-1935) and his family. 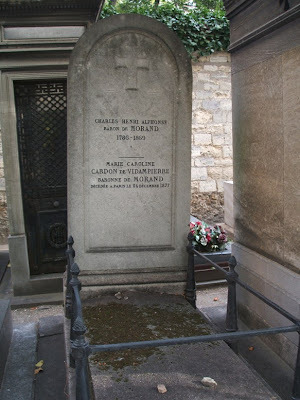 He was a French entrepreneur who first of all is remembered for the make of car named after him. 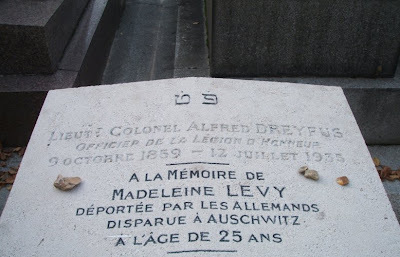 Grave of Alfred Dreyfus (1859-1935), a French officer made famous for the trial and conviction on charges of treason in 1894 (the Dreyfus affair). 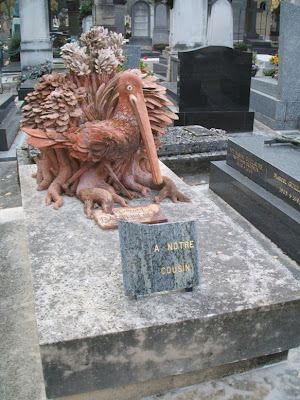 It was unfortunately not so easy to take a good photo of his grave. Artistic! 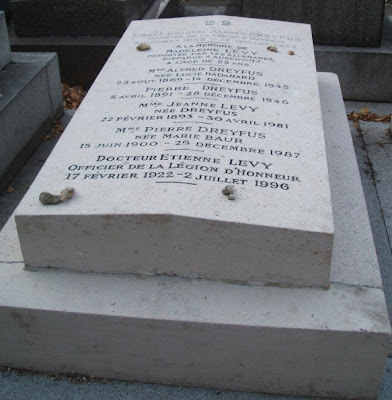 Grave of Gérard Barthelemy. 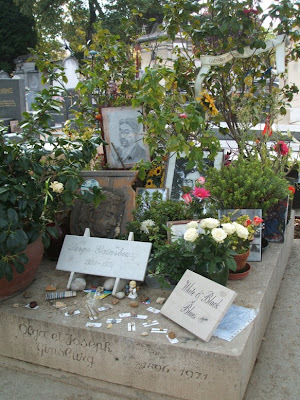 Grave of the singer, poet and actor Serge Gainsbourg (1928-1991). 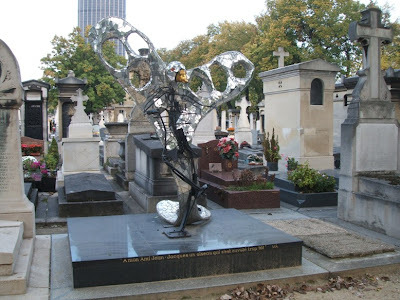 Grave of the artist Robert Thibier (1926-2001). 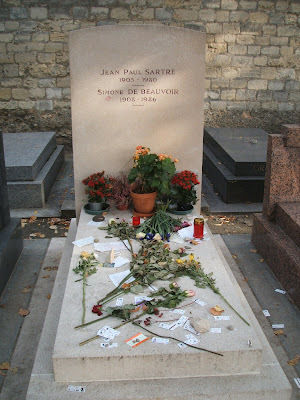 Grave of the philosopher and author Jean-Paul Sartre (1905-1980) and his partner, the philosopher, feminist and author Simone de Beauvoir (1908-1986). 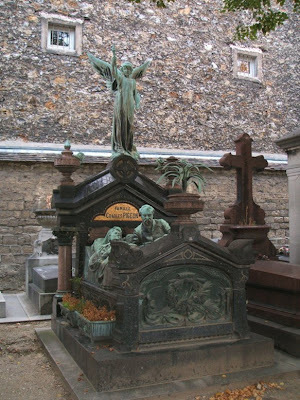 Grave of Baron Charles de Morand (1786-1869) and his wife Marie Caroline (d. 1877), née Cardon de Vidampierre. More details are welcome! A cat lover? 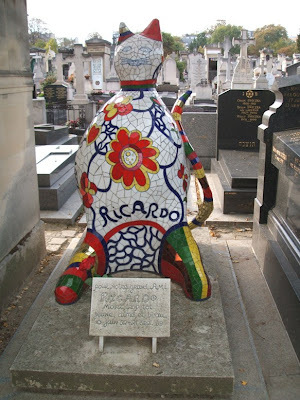 Grave of Ricardo. 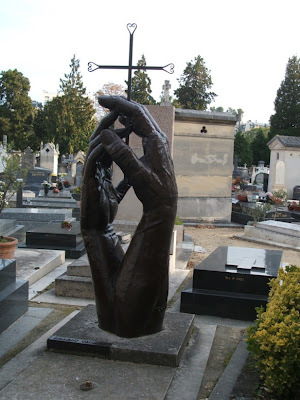 The sign says: "Pour notre grand Ami Ricardo. Mort trop tôt jeune, aimé, et beau. 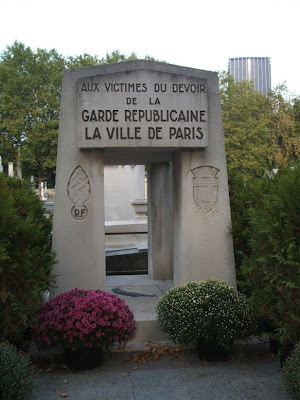 10 juin 52-21 sept 89". 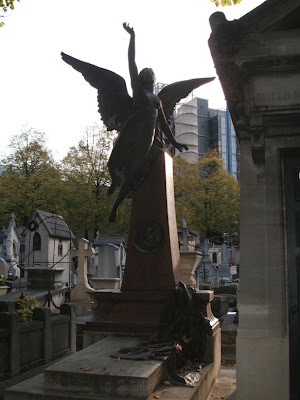 Cimetière du Montparnasse is situated in Montparnasse, Paris at 3 boulevard Edgar Quinet. The nearest metro station is also named Edgar Quinet (line 6). The cemetery can also be reached by bus 38, 83 an d 91 to Port Royal. Updated on Tuesday 16 March 2010 at 19:55.